Last month, scientists with the USGS reported that they had discovered that the Hayward and Rodgers Creek faults look like they are connected. This translates into the strong possibility that the seismic experts have underestimated the potential strength of the next big SF bay quake. There is the possibility that when the Hayward ruptures, it could register 7.4 – five times stronger than the 1989 Loma Prieta quake. I pass this on not to create paralyzing fear, but to encourage everyone to take care of the basics of getting ready: have your retrofit checked, have an automatic gas shut-off valve installed, secure necessary furniture, appliances, and wall hangings, keep backpack emergency kits in your vehicles, and have two weeks worth of food and water available. A reminder: my in-home QuakeConsult gives you a ton of helpful information, including all the things mentioned above (and more). Watch Out For The Glass! For large windows which are untempered glass, when anti-shatter adhesive film is applied, the shattering concern is resolved. Remember: installing the correct film on your large windows will make your house much safer for you and your family. group (or similar), and you have had us install an automatic gas shut-off valve, or you have had my in-home QuakeConsult, please recommend us to your neighbors! We’ve now surpassed 2,400 gas shut-off valves installed over the past 11 years. If you or a friend/neighbor/family member still don’t have one, get in touch with me now. If you ask for it, I’ll honor our recent $199 special price throughout July (slightly more away from the east bay area). Too often in my consultations, I see way too much clutter around peoples’ homes. If the safe places to take cover in a room are blocked by things that don’t have to be there, you could be injured in a big quake. Quite commonly, for example, I see so much stuff under a desk that it would be impossible to get under it when shaking starts. Be safe: take a look around. 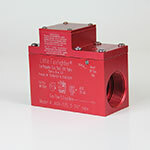 QuakePrepare has now installed over 2,300 automatic gas shut-off valves. If you or your neighbors haven’t yet taken advantage of this (incredibly cheap) insurance to protect your house, email or call me. Still $245 in most locations.